ITS TIME TO LIVE LIFE THE WAY YOU’VE ALWAYS WANTED TO. NOT JUST A HOME. GET YOURSELF A LIFE. Real estate player VIVANSAA builders limited edition row villas project at Banglore. BALSAAM needed a positioning that would appeal to a high class of mid-aged buyers that are wise enough to see the benefits of this limited edition row villas property & were successful enough to afford what VIVANSAA BALSAAM was offering. Pharma major Lupin Limited., considers ideas as mission critical, & wanted a campaign to urge the thousands of scientists they work with to embrace a open & vibrant innovative culture where ideas flow seamlessly & are shared & curated collectively. A very simple, to the point & crisp campaign was created using the dreamy scientist as the protagonist, & a very direct call to action. SHOWCASING MACHINES & MAKING ENGINEERING PRODUCTS LOOK AS GREAT AS THEY ARE. Alkop Aluminium Solutions. Mumbai, set up a green field facility to manufacture high integrity critical aluminium components for auto OEMs & electrical equipment manufacturers. They needed a corporate brochure that will showcase its manufacturing infrastructure, quality assurance setup & the products of the company for top OEM customers in India & abroad. Aluminium products are tricky to photograph. We succeeded in bring out the products to look as great as they perform. Showcasing the glamour & grandeur of PFW’s annual event in PUNE, we designed a campaign that was done across media that included Outdoor, Malls, Ads, Banners, Invites & others. EMPHASIZING TECHNOLOGY & CRITICALITY OF THE PRODUCT BY DEPICTING THE APPLICATIONS IN ALL ITS GLORY. Menon Bearings Ltd., supplies critical engine components to some of the most demanding & critical applications across a wide range of sectors, including leading auto OEMs. Depicting the range of applications in all its glory along the product packaging puts the brand in the context in which it should be viewed. PEOPLE NEVER GIVE UP. AND ONLY THOSE END AS WINNERS. Solaris, with its chain of health clubs across Pune & beyond, needed a campaign & branding solution for their annual health & wellness competition. Health & wellness are a long term goal, We designed a campaign that visually portrays the determination required of participants to sustain with their regimen to win. The branding was adapted for the media campaign as well as for the branding of the ground events. Christopher Columbus & the media managers quest for discovering a new world of purchasing power & growth. As the fastest growing publication in the state, Pudhari wanted to emphasize this to its corporate clients & agencies. The exploratory voyages of Christopher Columbus were used to urge media managers to look at the regions potential in a new light. This was done using the rate card as communication vehicle as it also combines a sales pitch & empowers with info to decide on a “call to action” simultaneously. DESIGNING TO POSITION GOEL GANGA DEVELOPMENTS MOTHER BRAND AS A PREMIUM & ELITIST BRAND. An elitist & premium branding is best done using photographic imagery that portrays & puts into focus the richness & elitism of the protagonists. The tag line “for those who want it all” underlines the all encompassing nature of the offerings of the mother brand of Goel GgangaDevelopments, one of Punes biggest & most reputed builders. The ebony wood finish & dark leather colours & textures were selected by us to specifically create an ambience ofpremium luxury. The theme designed primarily for exhibition stalls, is further adapted for brochures & outdoor. For Pharma major Lupin Limited, with thousands of employees at various levels, busting bureaucracy & hierarchy are a challenge. They wanted us to provide branding & a campaign & imagery for its employee engagement program. A simple “hello” put the entire scheme of things into perspective. Along with interaction images & a simple call to action, we succeeded in giving them a campaign that is simple, crisp & effective. Putting in focus on-field performance of superior technology with dramatic application imagery. MPR, a leading engine piston rings brand wanted a brochure for OEM marketing. For a product like engine piston rings that is fitted inside the engine, depicting performance visually is a challenge. We used a dramatic image of a truck speeding on the highway to emphasize the top notch performance of the product on the field. The high tech manufacturing & quality assurance setup was detailed with photos & charts. An aerial photo of their plant put their setup into perspective. Putting global field performance in perspective & showcasing range of manufacturing capabilities. Communicating field performance at the global level takes imagery That is as evocative of long term performance as much as it is global. 3D modeling of product operations inside the engine, aerial photography of the plant, full page blowups of high tech machines & the shops floor, table shot of product, together made this brochure a perfect representation of the capabilities ofthe award winning businesses of Menon Bearings Ltd.
For the modern professional techno geek: the liberating convenience of modern technology with the serenity of nature. We positioned VIVA LIFE a real estate project target to the young aspirational techno geek professionals in IT & other fields as a total solution to a lifestyle that combines the luxury of technology, the serenity of nature, & the health & wellness benefits afforded by an extensive array of amenities. The brochure & the campaign featured a young protagonist that is modern, suave, tech savvy, with a fire in his belly, not just to succeed but to live a lifestyle that is as comprehensively laid out as his ambitions. Financial Services is one the most competitive of all in the service industry. We have designed for & promoted financial services to prospective home loan buyers, salary account holders, current account holders, & even farmers for agricultural loans, for many clients in the financial sector. Some brands don't compromise on anything. For customers that don't compromise. Real estate decisions almost always involve the entirefamily. We branded Sentosa Elysium a real estate project at Wakad, Pune, as a no compromise solution for a modern new age family using photos that depict a family that is cost yet demanding... a family that won't compromise on any aspect of living. Sentosa Elysium was effectively positioned as an uncompromising product from an uncompromising builder......for an uncompromising customer. THE STORY, THE BRAND: BUILDING A LEGACY BRAND WITH LEGACY VALUES USING HISTORICAL SYMBOLISM OF THE ERA OF ITS GENESIS. Discovering the stories behind the brands excites us. Our research led us to the socio-political positioning of Pudhari as a brand born out of the idealistic political activism of the freedom movement. The most important asset of any media brand is its historical legacy & the values it espouses. We chose the nationally famous mural of Gandhijis Dandi Yatra as the central graphic to depict the core attributes of the brand: a.) nationalism, b.) historicity, & c.) activism. This was also inkeeping with the mood of the nation that started building after the Anna Hazare movement. To celebrate its 75th anniversary, brand PUDHARI was effectively depicted as sharing its values & culture with the defining era of its birth. A property with a location that is perfect for a laid back & serene lifestyle, is best promoted by depicting a personality that is also laid back & serenely relaxed. The customer always identifies with characters who live the lifestyle they yearn for. 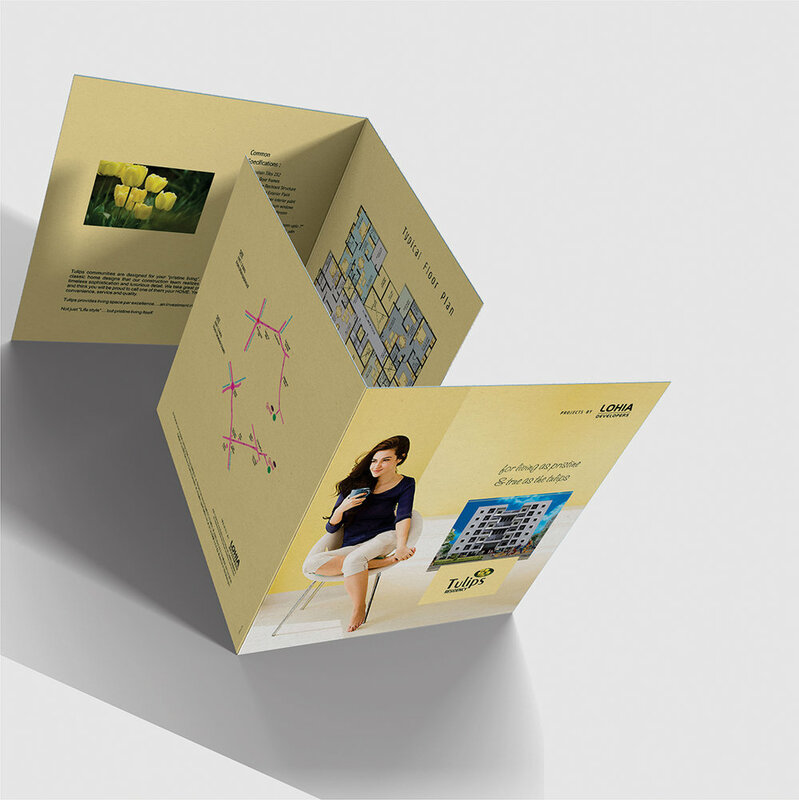 This is what makes this small brochure effective in positioning the property. by awarding them the status of a celebrity. Pharmaceuticals major, Lupin Limited, consistent winner of the GREAT PLACES TO WORK awards, takes the rewards & motivation of their more than 12,000 employees very seriously. We designed a permanent identity for the annual employee awards & created a campaign which was promoted using multiple contact points. These are the standies which we designed for campaigning to create a permanent identity of the client from market point of view.. Positioning MPL as an engineering technology led company, with the right shop floor values, culture & a problem solving attitude. A problem solving attitude, a total solutions company, a big & inclusive manufacturing & QC setup, this corporate brochure we did for Menon Pistons Ltd., an auto components manufacturer is one of the most comprehensive & well researched designs designs done by us. Photography that does justice to its expansive manufacturing & QA infrastructure & 3D modelling of the products were highlights of this corporate brochure. Live... play... grow... simple things that we look for to do at home. A proposition that is direct & succinct & crisp. The central imagedepicts a familythat is living together & playing together as it is growing together. A simple proposition that is fundamental to any home & any family. Our research suggests that pride of belonging is the biggest factor that motivates the choice of educational institutes for students across categories. There is no better way to emphasize the reputation of an institution than by indicating the pride its students experience by being there. Be proud, be a KITian says it all. What you study matters, but where you study... matters more. So study at an institution that will make you proud. We chose a gold & dark brown colour scheme to emphasize the premium positioning of the institution. Real estate decisions almost always involve the entirefamily. We branded Sentosa Pear a real estate project at Wakad, Pune, as a no compromise solution for a modern new age family using photos that depict a family that is cost yet demanding... a family that won't compromise on any aspect of living. Designing a new corporate graphic identity system for sound castings. Sound Castings Ltd, a 25 year old castings manufacturer needed a redesign for their graphic corporate identity to emphasize a changeover from their past to a new lineup of high tech manufacturing plants. We gave their identity a complete overhaul with a comprehensive, vibrant & dynamic corporate identity pattern. Turbo charging a brand with imagery ofspeed, printed on specially imported paper resembling the plastic feel & texture of a dashboard. As the fastest growing publication in the state, Pudhari Publications Pvt. Ltd. wanted to emphasize this to its corporate clients & agencies. Imagery of highways, dashboards & speedometers were used to emphasize the speed of growth. This was done using the rate card as a communication vehicle as it also combines a sales pitch simultaneously. Ultratec International, who are into manufacturing solar heaters had booked himself for CHINA. He needed an identity design for his company "asap". They loved the logo we gave them ...an abstract representation of the solar cell. It was approved in minutes. We gave him an identity design and applied it to his stationary overnight and delivered it to him, just in time before his plane could take off for China that evening. ...just get your doctor to come home ! We strive to ensure the highest integrity and diligence of management and adherence to ethical business practice by devising & implementing rigorous protocols, & deployingadvanced systems & infrastructure in all our activities. Vasan eye care, the world s biggest chain of eye care hospitals has a TG that is as diverse as can be. We launched this brand at multiple locations in Maharashtra using a wide variety of media & a stream of messages strategically structured to build the brand image over time. ...for people that are a class apart. Nothing matches the majesty of a horse ride. The feeling of coming alive with the unmistakable sound of the thundering hooves of a running horse, & the power of its heavy breathing ! Riding a horse is about power, & was reserved for the warriors & the ruling elite. Since ages, horses & horse riding is the stuff that make warriors & kings, legends & heroes. Kolhapur & Karveer with its rich tradition of royalty & nobility, is now host to the biggest equestrian farm in the region. With 2 farms totaling 85 acres, with world class trainers & horses, the Majestic Equestrian farms offer an experience that is unparalleled. We identify with a lot many celebrities because we love their technique. Celebrities from various fields were depicted as technicians to emphasize the theme of this college magazine with a glamorous effect. Students lapped it up as they identified & related the magazine & the theme with their idols they loved so much. Five generations of newsmaker personalities from various fields put legacy brand in temporal perspective. 75 years is a long period of time for any brand to be around. When Pudhari, one of the fastest growing publication in Maharashtra, completed 75 years, it needed a campaign to emphasize just this fact to its readers & advertisers in Pune & Mumbai. S.K. Pharma wanted to re-brand their product for better off takes. They needed a professional look & feel to their identity & packaging to differentiate their product from the slew of low quality ayurvedic products.